There are many amazing health benefits to using Blue Tansy essential oil. Also known as Tanacetum Annuum oil, it's derived from a North African flower and has an incredible blue color. We've researched and reviewed a variety of new and bestselling products to help you decide which Blue Tansy essential oil is the best option for you. In a hurry? 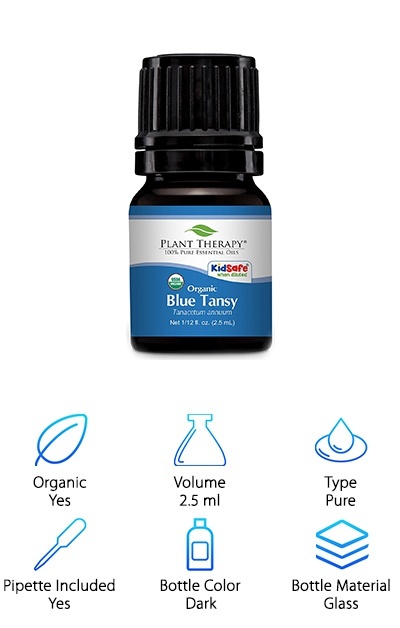 Take a look at the top 10 Blue Tansy essential oil reviews below. But before we jump into the reviews, check out these features to look for when shopping! Organic – Choosing an organic or regular oil is a personal choice. For some people, organic essential oils are a good option because they want to ensure that their product is top-notch. The best quality oils also meet therapeutic standards. For many standard uses, regular essential oils do the trick. 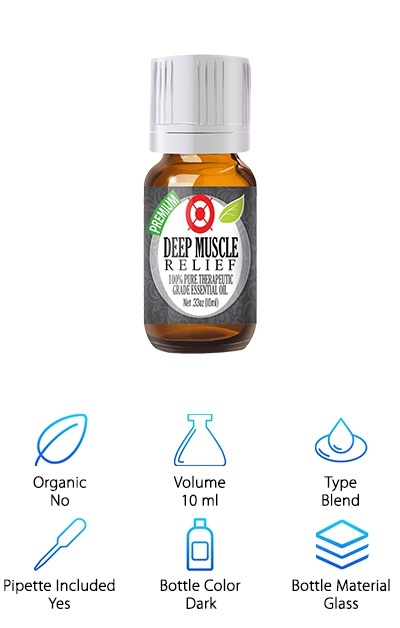 Volume – Most essential oils come in 5, 10 or 15 mL bottles. Depending on your needs, you may need a smaller or bigger size. For occasional use, a smaller 5mL bottle may suffice. However, if you find that Blue Tansy essential oil is a great complement to your daily routine, consider purchasing a bigger bottle. Type – Essential oils come in two different varieties. First are pure essential oils, which feature the extract from one particular plant. Second, you have essential oil blends, which combine the smells and properties of two or more blends. Pick the one you prefer. Pipette Included – Pipettes allow you to precisely measure the amount of oil you need for each application. Many essential oils include a pipette, which makes it easy for you to use it right out of the box. Others require you to supply your own pipette. Bottle Color – Essential oils can be sensitive to light, and different colored bottles offer different levels of protection from degradation. 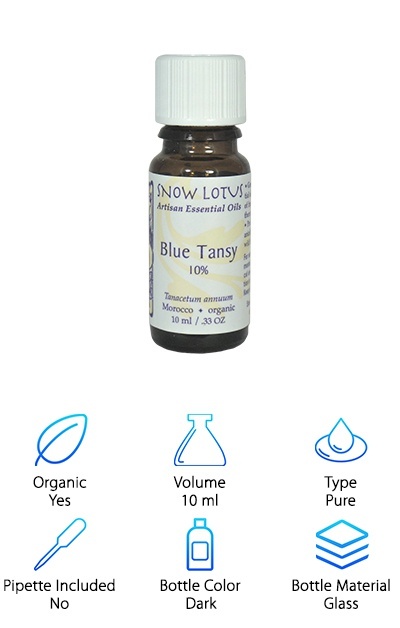 Tansy essential oil is a beautiful blue color, and it's a great idea to help maintain its original composition. Brown bottles are the industry standard for preserving essential oils. Bottle Material – Some Blue Tansy essential oil bottles are made of plastic, while others are made with glass. When essential oils are strong and pure, it's important to store them in airtight glass containers. This is because the strength of the oil can deteriorate rubber and plastic. Here's the deal: there are many choices when it comes to Blue Tansy oils. Because of its rarity and incredible properties, it's highly sought after. The remarkably blue tones of the oil are complemented by its ability to soothe your body and mind. Now that you know how to choose the best products for you let's take a look at our reviews. If you need a quick answer, take a look at the top pick and budget pick. Enjoy! If you're looking for a strong concentration of Blue Tansy essential oil, look no further than Miracle Botanicals. Their organic oil has 6.85% Chamazulene - that’s the compound that adds the blue tones to the oil. The high percentage indicates a very concentrated product. 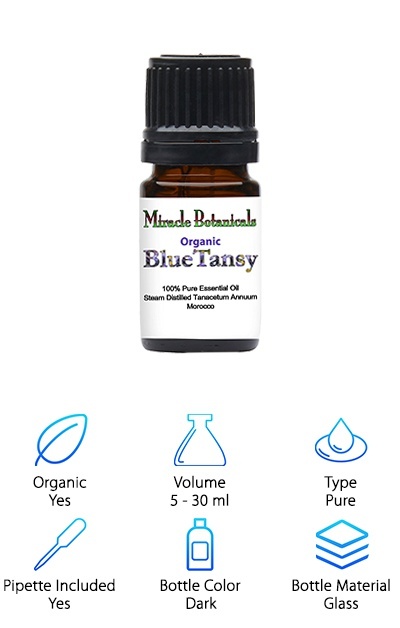 So if you're looking for a potent oil, Miracle Botanicals Blue Tansy Oil is an excellent option. Its high quality gives you the chance to enjoy the best properties of the oil for multiple uses. This Blue Tansy oil checks off all the marks for an incredible product, so it is sure to please. 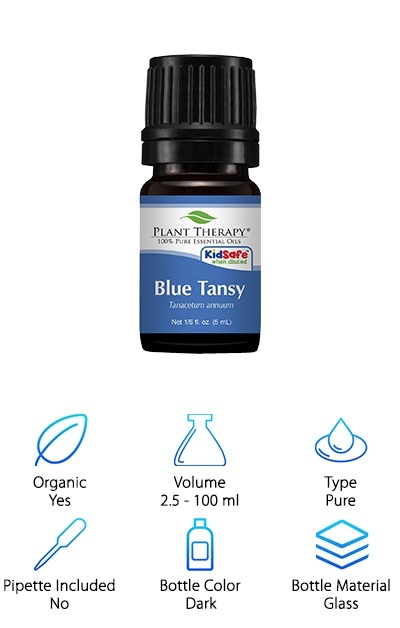 The Plant Therapy Blue Tansy essential oil offers excellent value and quality and is one of the best Blue Tansy essential oils available. The product is USDA certified organic and offers many benefits. Blue Tansy essential oil uses are only limited by your imagination and its calming properties make it a popular option for aromatherapy and massage. 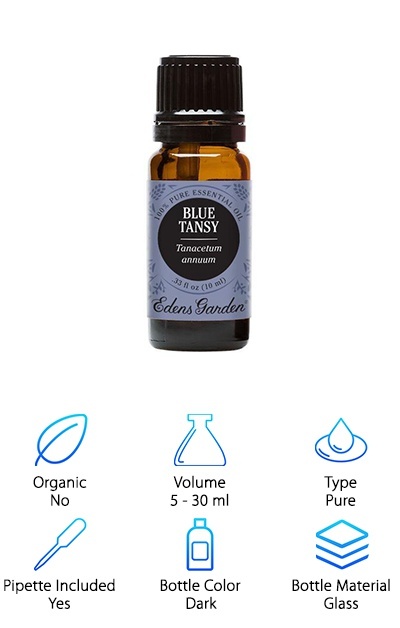 It's a good option for those who are starting to explore the benefits of Blue Tansy oil and want a product that offers excellent value. Use it to unwind after a long day at work, or add it to your nightly routine before bedtime. 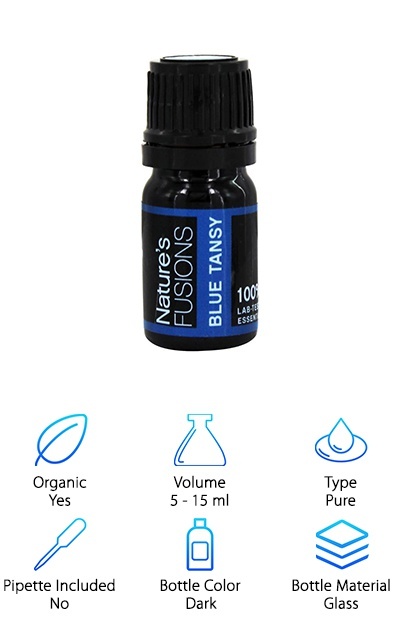 Nature's Fusions has Blue Tansy essential oil made of Hungarian flowers. It's useful for unwinding and promotes relaxation. This oil was manufactured using high pressure to preserve its natural balance and properties. It gets better: it's also an organic product, so you can rest assured that it's free of pesticides and GMOs. Diffuse it or dilute it with carrier oils to apply topically to the skin during massage (always read all instructions first). This is a very well-made oil with a high-quality bottle to keep it fresh. We recommend it! If you're looking for a high-quality oil that is tested to be 100% certified and pure, look no further than Eden's Garden. Their Blue Tansy oil is free of GMOs and pesticides, so you can be sure that it's of the highest quality. The oil works well for relaxing stressed minds and promoting self-wellness. Want to know the best part? The smell is rich, deep, and incredibly intense – without being distracting. Eden’s Garden is known for excellent essential oils, so we had to include this amazing product on our top 10 list. The Snow Lotus Blue Tansy Oil is harvested from wild plants in Morocco, giving you an exceptional product. This oil is great for promoting calmness and emotional balance. This batch was extracted through steam distillation, resulting in a very pure and high-quality oil. We like that the company then packages such a high-end extract in a small, dark glass bottle to preserve all its properties and quality for your use. This is a great product. Plant Therapy offers an undiluted Blue Tansy essential oil. Also known as Tanacetum Annuum Oil, this is a therapeutic grade oil and tested for purity against the highest GCMS standards. Because it was checked so thoroughly, this is a great option for someone who is highly conscious of the products they purchase and uses them regularly. The oil has an incredible, beautiful fragrance that’s almost addictively good. What else could you ask for in an essential oil? This is a winner! The NuKira Blue Tansy Oil comes in an easy-to-use 10 mL bottle. The oil is undiluted, so you should dilute it with a carrier oil for most uses. This is a 100% pure product without any fillers which is reflected in the bottle size and also the price. Still, you get a lot of value here! If you're interested in mixing this oil with other types, consider blending with Cedarwood or Rosemary essential oils, you’ll love it. The many calming properties of Blue Tansy oil also make it ideal for many home uses. The Healing Solutions oil is a truly incredible blend of Clove, Helichrysum, Peppermint and Wintergreen oils. Where is the Blue Tansy? Well, it doesn’t have any but the smell does remind us of it quite a bit so we thought we include this blend as an option. The ingredients are guaranteed to be pure and therapeutic grade. Use it during a deep-tissue massage for great results. Anyone can find great benefits to using this Healing Solutions oil blend. This is a revitalizing essential oils blend with Tangerine, Orange, Ylang Ylang, Patchouli and Blue Tansy oils. This mix is undiluted, giving you a pure product that packs a punch. It helps you calm down and can be mixed with milk and Epsom salts (check the instructions first). In today's fast-paced world, this Let It Go blend is the perfect answer to helping with stress and emotions. You owe it to yourself to enjoy peace of mind, so try this Plant Therapy blend. 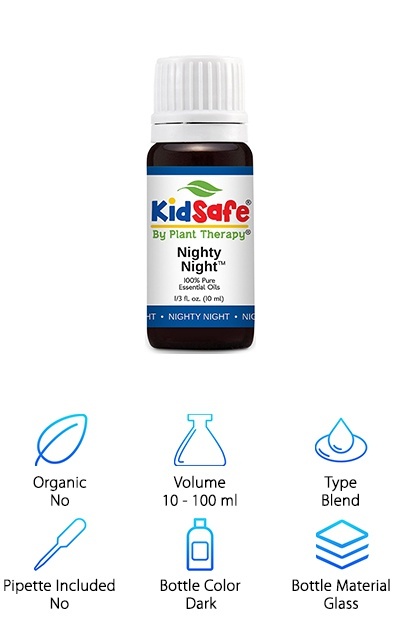 A unique item from our Blue Tansy essential oil review, the “KidSafe Plant Therapy” blend gives children a new way to enjoy essential oils. This blend combines Lavender, Marjoram, Cedarwood Atlas, Patchouli, Clary Sage, Chamomile Roman, and Blue Tansy for an effective and gentle way to relax children. Anything that helps kids ease their way into bedtime is surely a welcome addition to any parent's box of tricks (keep it away from small children, of course).